In the interests of openness, I should say at the outset that I enjoy eating #LCHF. This means a low carbohydrate (not a no carbohydrate) and a relatively high natural fats diet. It helped me lose weight when I needed to, and it allows me to maintain it where I want it to be. This is statistically n=1, of course, but it works for me, and I know it works for lots of other people too. When this book appeared, I didn’t need to be converted, but I much appreciated clear and scientific explanations of what I have experienced. However, it’s much more than a #LCHF manual; it explains how dietary advice has been seriously fucked up for decades, through pride, prejudice, funding, sheer pig-headedness, the power of industry lobbies... The list goes on. I doubt I’ve ever laughed out loud while reading a book about diet or nutrition, so this was a first. In a splendid attempt to demonstrate that correlation doesn’t always mean causation (the Don’t Jump To Conclusions Principle), the authors of Eat Rich Live Long produce a graph that plots the incidence of divorce and the per capita consumption of margarine in the state of Maine. And would you believe it, there is a virtually exact correlation! So, according to some models of very poor research, it can be argued that margarine consumption is causing divorce or, possibly divorce is driving an appetite for non-dairy spreads. This is by way of introducing Ancel Keys, the man who developed the diet-heart hypothesis. Essentially it states that saturated fat increases our cholesterol and, as a result, our risk of coronary heart disease goes up. Back in the ‘fifties he cherry-picked statistics for his so-called Six Countries study which was subsequently rubbished in the New York State Journal of Medicine. Humiliated, he proceeded to produce his Seven Countries study, focusing on just 12,700 men (zero women) and very narrowly in terms of dietary information for the subjects. He was cherry picking again, an act much later described as one of “scientific chicanery”. It was not until 2017 that the Prospective Urban Rural Epidemiology (PURE) 7 year study, having looked at 135,335 men and women in 18 countries, contradicted Keys and demonstrated that the opposite is true. PURE found that there is no association between eating saturated fats and increased morbidity from any cause, including cardiovascular disease. By contrast, high carbohydrate consumption was associated with increased mortality. One of the core messages of this serious but accessible book is that, while we have never been more lectured at about “healthy eating”, people are getting fatter and fatter. The authors argue that the old dieticians mantra of “calories in, calories out” has never been of any use whatsoever. In other words, we are human beings, not steam engines. The fact that fat is the most calorific of the macro-nutrients has been used to justify the low fat diet approach to weight control and to health in general. “Any dietary advice that doesn’t account for insulin’s effects will be deeply flawed,” they write, and it does seem there’s a lot of such dubious advice in circulation. Scientists are human and subject to the same influences as the rest of us. It strikes me that some nutritional scientists and a great many dieticians are almost religiously resistant to any revision of what they have believed and handed down over the past fifty years or more. There’s a touch of Papal infallibility. These die-hards remind of me Brexit extremists who argue that the UK will be magically better off when all links to the EU are severed. No evidence to the contrary appears to have any effect. However, the fact is that humans are fattened primarily by carbs. The authors mention, in passing, that Sumo wrestlers depend on this, and tend to come to grief after their gruelling professional days come to an end. Refining carbs, by taking fibre away from grains or manufacturing high-fructose corn syrup, “supercharges the problem exponentially,” according to the authors. But the key problem upon which they focus is the metabolic dysregulation that excessive carb consumption produces over time, especially the over-secretion of insulin, leading, ultimately, to insulin resistance. They argue that the most important thing that you can do to lose weight, reduce the risk of heart disease and increase longevity is to keep insulin levels low. The worst possible diet is one that is high in carbs and high in fats, they say, while the best possible diet is low carb and high in healthy, natural fats (i.e. not processed fats or vegetable oils like soyabean). Before embarking on a detailed account of how to achieve the optimum diet, Cummins and Gerber remark that “it’s not easy to overcome an indoctrination that started in your earliest years”. At this point the book becomes a user’s manual for low carb/high fat eating and there are plenty of rather attractive and appropriate recipes. Overall, it’s a weighty – no pun intended - tome, the antithesis of a diet fad book, scientifically grounded, cogently argued and, while naturally a bit technical at times, never in a way that should deter the intelligent reader. The authors are intent on making readers aware of what is happening when they eat, and this is a complex issue, so be prepared to do a little work on understanding. 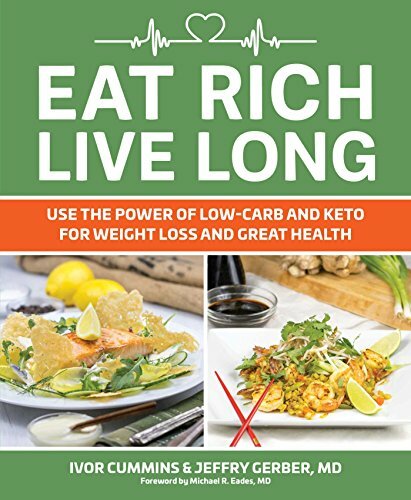 I heartily commend it while wanting to suggest that a pared-down version might be useful in spreading the #LCHF good news to a broader audience who are happy with the bones of the science and clear guidance on what to eat and, more importantly, what not to eat. Ivor Cummins is an Irish chemical engineer whose analytical approach and detailed knowledge of this area has led to his addressing the annual conference of the British Association for Cardiovascular Prevention and Rehabilitation last year. His advocacy of the #LCHF diet has attracted the opprobrium of some nutritional academics. One of these, I see, does consultancy work for Nestlé and chairs a consortium on breakfasts which is part-funded by Cereal Partners Worldwide. Jeffery Gerber is a family physician based in Denver, Colorado.